Building Professionals | Unitex® Your Walls, Our Pride. Unitex: Supporting Australia’s Building Professionals. Support throughout the design, specification and construction phases. Unitex provides MSDS and TDS files on all Renders & Textures, as well as DWG CAD files of all Uni-shape Profiles & Columns. The extensive and constantly updated Brochures & Application Guides make specifying Unitex products convenient and reliable, from drafting through to final construction. Need more information? Our Technical Sales Representatives are always available to meet on site, to discuss your projects requirements. Unitex and Revit – the perfect partnership. Unitex has recently launched its’ superior range of Architectural Mouldings and Columns, Renders & Textures, as well as the Australian markets’ highly accredited cladding system, the Unitex Baseboard System, onto the market leading Architectural 3D modelling software – Revit. Be protected with Unitex. 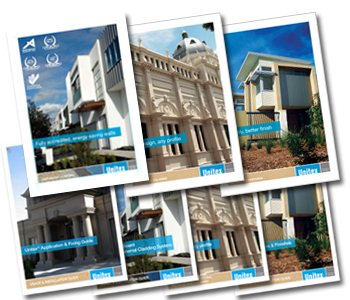 The leading Australian Codemark accredited Cladding System. When specifying accredited systems under CodeMark, BAL 29, and BAL 40 the Specifier is fully protected as the Unitex Baseboard System is deemed to satisfy all requirements of the Building Code of Australia (BCA/NCC). Unitex Baseboard System – CodeMark accredited to comply with the Building Code of Australia – the leading Australian CodeMark accredited full system. Unitex recommends for you and your clients safety and protection to PC Unitex Baseboard System as your external cladding. This is because it ALWAYS works, and offers the highest wall insulation R-values available for greener buildings. As the leading fully accredited full cladding system in Australia – your design specification and reputation is firmly protected. Meet with one of our experts! Fill out the form below to organise to meet with one of our Technical Sales Representatives. You can also select which samples you would like, and you will receive a copy of Unitex’s extensive product guidelines and brochures for your reference.